Happy New Year! I wish you all the best in fulfilling your new year resolution. May the biggest slice of happiness fill your heart and home. I am looking forward to all the food adventures awaiting in 2010. Ever wonder about the dessert on the header page of this blog. This is my favorite childhood dessert. Each time we go to a bakery in Chinatown, this is always the first dessert that I choose. 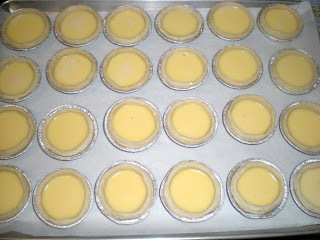 Now that I know how to make a pie dough, I have my family version of making egg tarts. 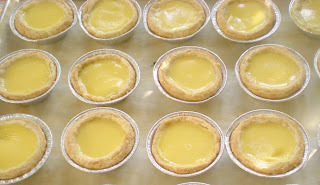 I usually make egg tarts only in very special occasion. My friends can basically taste it once every year. They often bug me to make it, but I always say "when the time comes, I will make it". Now, this is the time of the year where my family and friends come to Montreal and celebrate Christmas and New Year. The first batch was made during the family reunion and I baked about 3 dozen egg tarts. At the end of the day, they were all gone and they all loved it. I wanted to save some for my collective cooking buddies since some of their birthday occurs during the holidays. So today, I made a second batch of egg tarts. Hopefully, they won't be all gone tomorrow. 1. Prepare 24 3-inch tart moulds. Shape pie dough by pressing it onto the moulds. Make sure that it goes higher than the edges. 3. 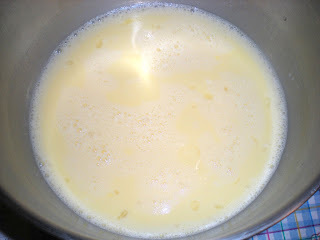 In a small saucepan, mix water and white sugar over medium-high heat. Stir until dissolved. Remove from heat and cool to room temperature. 4. In a large bowl, whisk eggs, sugar water, evaporated milk and vanilla extract until uniform. 5. 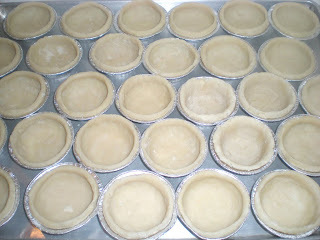 Fill tart shells to 3/4 full. Bake for 15-20 mins until golden brown and filling is lightly puffed up. THESE SOUND WONDERFUL AND LOOK FABULOUS HAPPY NEW YEAR! Thank you for sharing this wonderful recipe, Happy New Year! Happy New Year! Wow what a great recipe! I love that you shared it with us! I wish I was one of your friends, I'd love to try one! Happy New Year! Well, if you do pass by Montreal, let me know I'll let you taste one of my special tarts. Happy New Year to you all! Beautiful dessert with a lovely meaning to you! Thank you for visiting sjgourmet.com, I hope to see you again and good luck with your cooking club! This sounds like a most delicioius dessert. How lucky your family and friends are. Something special for them to look forward to all year long! Happy New Year to you. I'm really much more enamored of the flaky tart crust style rather than the shortbread crust style. Do you have a recipe for that? @ Nate : Actually I do in my last year post, I forgot to link the pie dough recipe. The trick for a flaky is not to overwork it and not too much water, but it takes experience. Store bought pie doughs or puff pastry do well also. @ Anncoo : I received a Ph.D position in Singapore at NUS, so I might come over to you if I do decide take this position. Those look great Victor! Lucky for everyone at your house to get to try those...yum! victor these litle tarts look so good to me you start well the year !! Happy New year! And I always assumed they were Portugese natash...they look yummy! I pick these up in Chinatown every time I go! Happy New Year! A staple of Chinese New Year! Thank you for posting this recipe. The egg tarts look great! I have a question about the tar molds. Are those the disposable foil ones that are normally used for selling the tarts at Chinatown bakeries or are they the reusable metal ones? If they are the foil ones, where did you buy them from? Thanks! Hi Anonymous, glad you enjoy the egg tarts. We keep a pile of disposable ones when we buy tarts in Chinatown and reuse them. They are still in good conditions. For the foil ones, I know that my mother's friend buy them where they sell restaurant supplies.